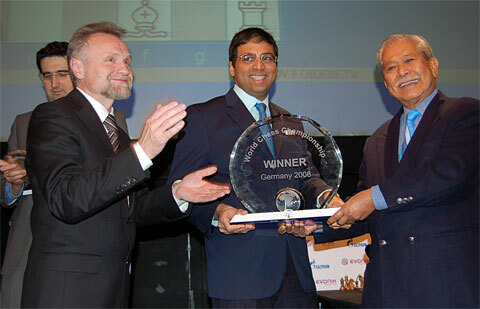 ChessMaine: WCC Bonn Round 11: Vishy Anand World Chess Champion! WCC Bonn Round 11: Vishy Anand World Chess Champion! 10.30.08 Playing the white pieces in game 11, Viswanathan Anand, after a complicated struggle, navigated the game into the safe harbor of a drawn position to retain the title of Classical World Chess Champion and take his rightful position amongst the game's greats. Congratulations Vishy!